The GardenWorks Project coordinates events throughout the year to bring together people who wish to grow food for themselves and those in need. We offer organic vegetable gardening programs, volunteer events, and opportunities for you to support our mission. Come on out and meet like-minded neighbors dedicated to growing organic produce at home and supporting families who rely on food pantry assistance. We want to help relieve the financial barriers to starting community gardens. In February, 2017, we opened applications for support groups who wish to start or expand their community garden in DuPage County. To be eligible, a portion of what is grown in the garden must be donated to a DuPage area food pantry. In 2018, after a successful pilot year, we will be continuing our Community Gardening Program, and will be choosing another 5 new organizations to establish or expand a community garden in their chosen area. For more information please email info@gardenworksproject.org. Award-Winning Organic Gardener Vicki Nowicki will be presenting at The GardenWorks Project Resource Center in West Chicago on Wednesday, February 7th at 7:15pm. She has been working with homeowners in the Chicago area for almost 40 years from her home and garden. She is a teacher, a writer, a community leader and she owns a business “with an ecological conscience” that focuses on planting and harvesting vegetables for the clients at home. She currently also runs an heirloom seed saving resource library in Downers Grove.Also, we will be holding a friendly seed exchange with fellow gardeners that have been saved from individual gardens. We will be holding this at 7pm, shortly before the presentation by Ms. Nowicki. The event will be a casual setting and no rules about how seeds should be packaged. We will also have the opportunity to sign up for the Food Growers Network at this time. $5 suggested donation to support our mission. You can also join our Food Growers Network for $20 and enjoy free events all year. Start your garden organically at our Organic Vegetable Seedling Sale! ORDER NOW! We will also have plants available onsite at the seedling sale while supplies last. The GardenWorks Project Organic Seedling SaleMay 19, 20189am-3pm (while supplies last)The GardenWorks Project Resource Center, 103 W. Washington St. parking lot (or inside in case of rain) Seedling price: $1.50 each for Food Growers Network Members, $3 for nonmembers. Our organic seedling sale, held in conjunction with Blooming Fest in downtown West Chicago, raises much-needed funds so that The GardenWorks Project can continue to provide families in need with home vegetable gardens, and promote home and community food growing throughout DuPage County. Our seedlings are organically grown in DeKalb, IL. Blooming Fest has much for you to enjoy - perennial plant sales, garden art vendors, educational events, food, and more. In addition to The GardenWorks Project’s vegetable seedling sale, we will also be giving away used tools to anyone who wishes to start a garden at home but doesn’t have the resources to purchase new tools. Pre-order your seedlings now to ensure you get your top picks. Your order must be picked up between 9 and 3 on May 19 - NO EXCEPTIONS. If you purchase your seedlings online and do not pick up on the day of the sale, the plants will be donated to a family in need via our Home Gardening Program. We just don’t have the facilities to store plants at our Resource Center. We appreciate your understanding. Want to volunteer at our plant sale or information booth at Blooming Fest? Email tina@gardenworksproject.org and let us know! We will provide you with a free tshirt to wear the day of the Fest. Gardening with raised beds can allow for bigger harvests and less work. GardenWorks Project founder and board member Tina Koral will teach you the benefits of raised-bed gardening, what supplies are needed, and how to design your garden on any budget. The presentation is heavy on photos of many different styles of raised bed gardens to inspire you to design your own before the growing season starts. We'll make it easy for you! Consider purchasing a 4' x 8' cedar raised beds kits to take home and assemble after the class. Proceeds from the sales of our raised bed kits support our Home Gardening Program, which provides families who rely on food pantries with everything they need to grow food at home. The class will be held at Gallery 200, on the corner of Washington and Main St. in West Chicago. Doors will open at 6:30 to allow time for you to browse our extensive seed collection. Make a donation of $20, and you'll receive 20 seed packets, a reusable tote bag, 20% off raised bed kits, and 50% off at our organic seedling sale on May 19. You may pre-order your bed here for pick up at the class. Members of our GardenWorks Project Food Growers Network save 20% on raised beds. Sign up for membership here. RSVP today and bring a friend! 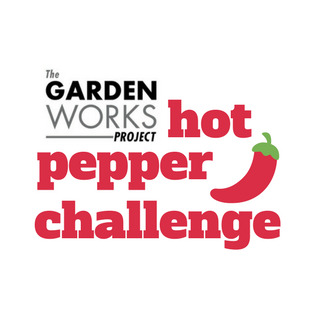 This year, The GardenWorks Project and our team of volunteers will build over 90 home vegetable gardens for families in need of food assistance in the DuPage County area, and we need your help! This weekend we will be in Aurora, Carol Stream, Darien, and Naperville. If you'd like to volunteer, please plan to attend our Spring Kickoff Volunteer Meeting, to be held April 18th at 7pm in Wheaton. 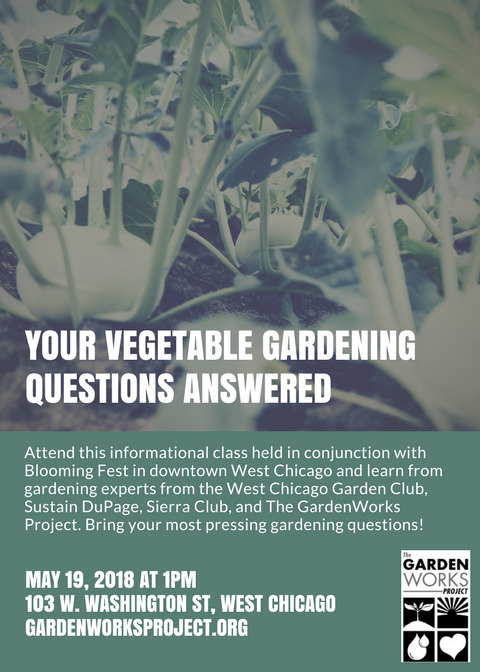 The GardenWorks Project will hold an Organic Vegetable Seedling Sale and Used Tool Giveaway in conjunction with Blooming Fest in downtown West Chicago with sales benefiting low-income families participating in our Home Gardening Program. Blooming Fest is a celebration of Spring, with many vendors selling plants and gardening supplies, delicious food, and entertainment. 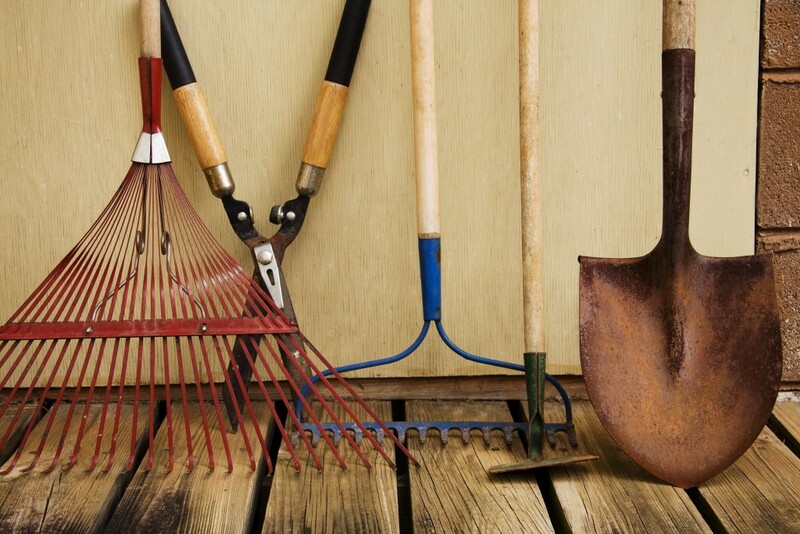 For those who wish to garden at home but cannot afford tools, we will have a large assortment of free tools including shovels, hoes, and rakes. See you there! The GardenWorks Project supports all gardeners in their efforts to grow food at home. For those who wish to garden at home but cannot afford tools, we will have a large assortment of free tools including shovels, hoes, and rakes, while supplies last. This event is held in conjunction with Blooming Fest in downtown West Chicago. Blooming Fest is a celebration of Spring, with many vendors selling plants and gardening supplies, delicious food, and entertainment. The class is free, but please RSVP. This event is held in conjuntion with Blooming Fest in downtown West Chicago. Blooming Fest is a celebration of Spring, with many vendors selling plants and gardening supplies, delicious food, and entertainment. The GardenWorks Project is also holding an Organic Vegetable Seedling Sale and Used Tool Giveaway. For those who wish to garden at home but cannot afford tools, we will have a large assortment of free tools including shovels, hoes, and rakes. See you at Blooming Fest! We would like to invite everyone to come help us pack up client bags in preparation of our build season. We need to prepare over 80 bags with garden tools and seeds for clients. We'll also be organizing our resource center to get ready for all our seedlings to arrive. All ages welcome, little ones can help put tools in bags too and if they get bored we'll have some garden coloring sheets they can color.